What this image shows is 20 minutes of recording of the airspace before and after the shooting down of MH17. 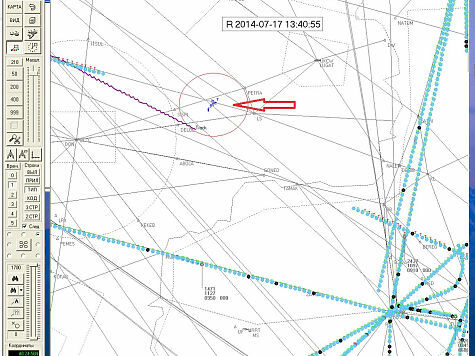 The course of MH17 is shown in purple while the numerous little blue "T" shaped objects in the circle show the radar return of one or, possibly two, aircraft which either do not have a transponder or which have not switched it on. Either way, since we know that the Novorussian Resistance did not have aircraft, and since we know that the Ukrainians have denied that they had any aircraft anywhere near this area at that time, and since we know that had this been a Russian aircraft the US/NATO AWACS and satellites would have picked it up and presented this damning proof a long time ago we can come to the only possible conclusion: the Ukies and their US/EU patrons are lying, the aircraft seen on the radar are Ukrainian, no Buk missile was involved in the shooting (though I personally believe that one was used to cue the Ukrainian aircraft to MH17) and that MH17 was shot down by a combo of gun and missile fire from one or two Ukrainian aircraft. PS: by the way, if a civilian radar needs a return signal from a transponder to get the identity, altitude and speed of an aircraft, military radars do not. Since I am quite sure that the Russians also had plenty of military radars in the region, I am equally sure that, just as the US and NATO, the Russian military also has the ironclad proof that the Ukies did it in the form of radar track recordings. Whether they will ever present such proof or not (and I am sure that they would prefer not to) or whether they will only generate such "leaks" from civilian sources as the one today in MK instead is unclear to me. I guess it depends on what the AngloZionist propaganda says.